MSE Creative Consulting Blog: No Nation Would Jail Its Citizens For Talking About the Weather, Right? 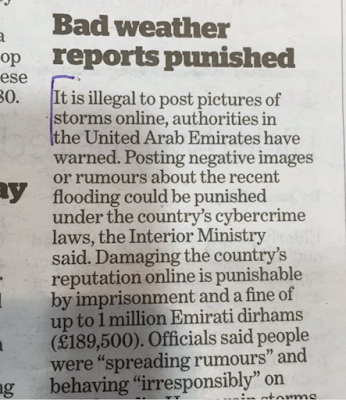 No Nation Would Jail Its Citizens For Talking About the Weather, Right? 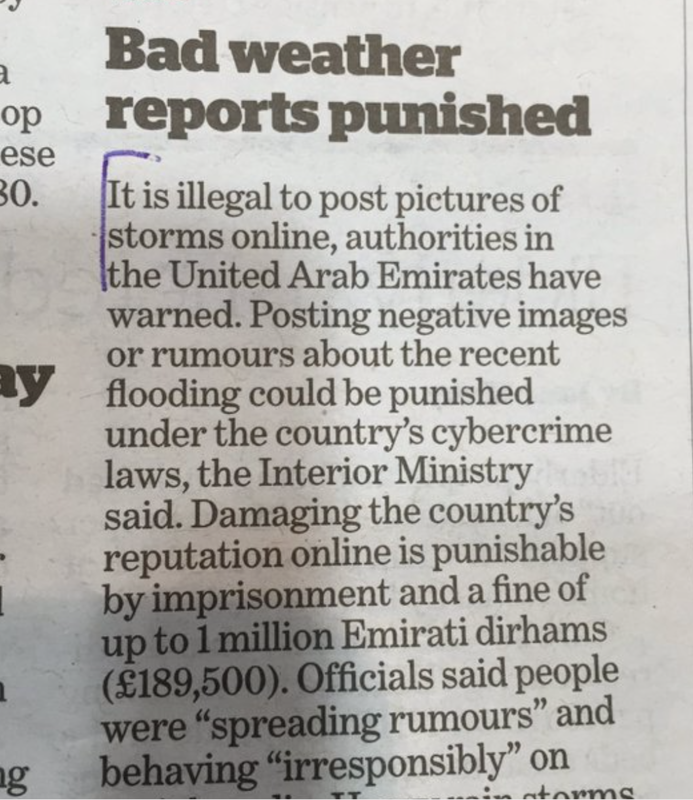 The UAE is cracking down on people who talk about floods and storms! How primitive and stupid, right? Of course, the United States has the First Amendment and putting people in jail for talking about the weather could never happen here. No, wait! “This matter has been discussed. We have received information about it and have referred it to the FBI to consider whether or not it meets the criteria for which we could take action on,” Lynch said at a Senate Judiciary Committee hearing on Justice Department operations. Unfortunately, the above is not from The Onion. The Obama Administration obviously does not care about the First Amendment and, horrifyingly, it appears that neither Trump nor Clinton do, either. Exit question: Where are the nation's editorial writers? Where is the ACLU? The first amendment is to the United States constitution not to the UAE. While I agree that what they are doing is horrible I don't understand what we as a country are expected to do in this case. Definitely one more reason not to visit though. With respect to only the U.S.: I wonder if 'knowingly spreading falsehoods' with an aim to control public opinion, so as to maintain corporate activities that are destroying our environment isn't quite a bit beyond first amendment rights. Further, a collusion of interests being involved might raise the issue to a racketeering level where RICO laws would kick in. https://en.wikipedia.org/wiki/Racketeer_Influenced_and_Corrupt_Organizations_Act I'm guessing that these aspects are the meat of the discussions taking place.